The year 2011 marks the anniversary of an important paleontological discovery, the first feather and subsequently the first specimen of Archaeopteryx lithographica, discovered in 1861 and today hosted in London. To celebrate the "Darwin year" 2009 during the Munich Mineral Show there were displayed six (the less known examples, and the single feather counts as entire bird) of the ten recognized specimens of Archaeopteryx, and because it's a rare opportunity, and Archaeopteryx is a pop-icon of earth sciences, here they short stories (P.S. the photos are not the best I have ever made, but the conditions of the display were not optimal). The first evidence for Archaeopteryx was an imprint of a single feather discovered in 1860 in a quarry near the village of Solnhofen. This fossil was the first evidence for birds in the lagerstätte of the Solnhofer limestone - and the first evidence for Mesozoic birds. 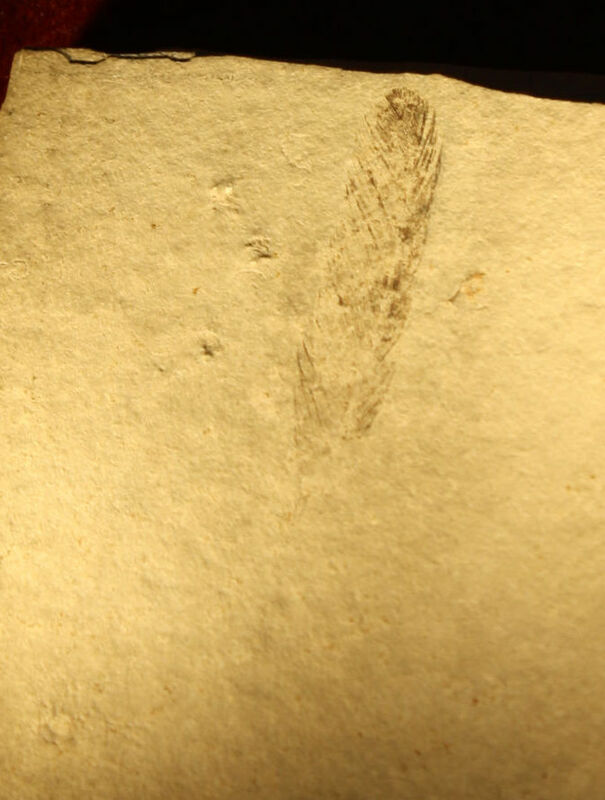 Studying this feather the German paleontologist Hermann von Meyer proposed to attribute it to the species Archaeopteryx lithographica in 1861, even if today it is not clear if it can be related to the found skeletons in the same formation (one part of this fossil is today hosted in the collection of the Paleontological Museum Munich, the counterpart is treasured in the collection of the museum for Natural history in Berlin). Fig.1. 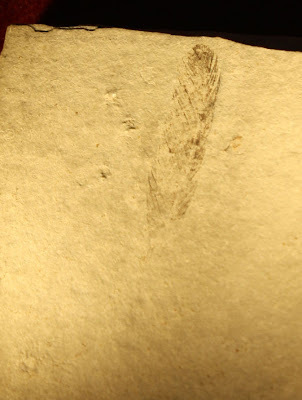 The famous first feather of a Mesozoic bird! 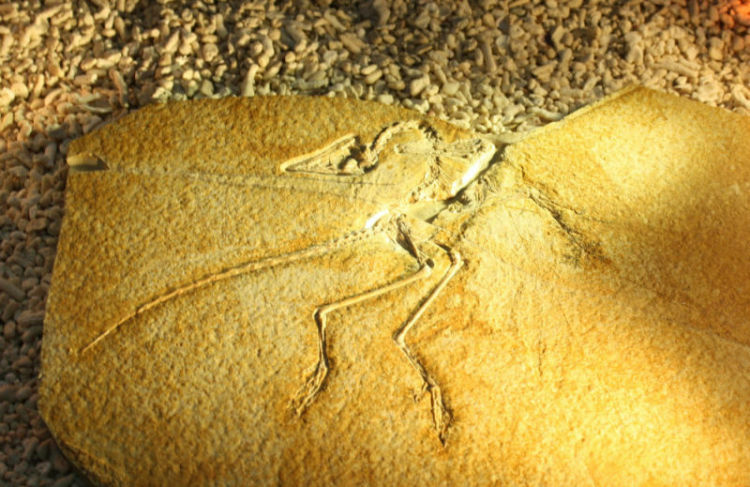 The fifth specimen of Archaeopteryx to be discovered is the smallest off all and is interpreted to represent a juvenile animal. The fossil is well preserved, especially the skull. Discovered in 1951, it was first (as many times before and after) mistaken for a pterosaur, and sold to the collector Franz Xaver Mayr, who also in a first moment identified it as Compsognathus, a small dinosaur. After he realized his error Mayr hold the discovery secret until 1972, fearing legal issues. In 1972 he finally showed the fossil to Peter Wellnhofer, the custodian of the natural collection in Munich. In the following years Mayr and Peter Wellnhofer published the discovery. 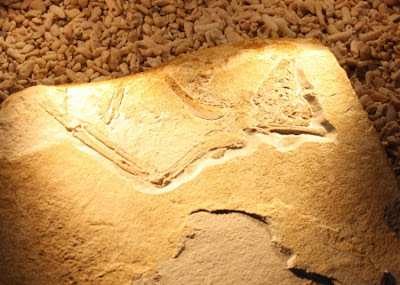 Since the opening of the Jura Museum in the (village) city of Eichstätt in 1976 the fossil is displayed in the collection of the Museum. Fig.2. The specimen of the museum of Eichstätt. 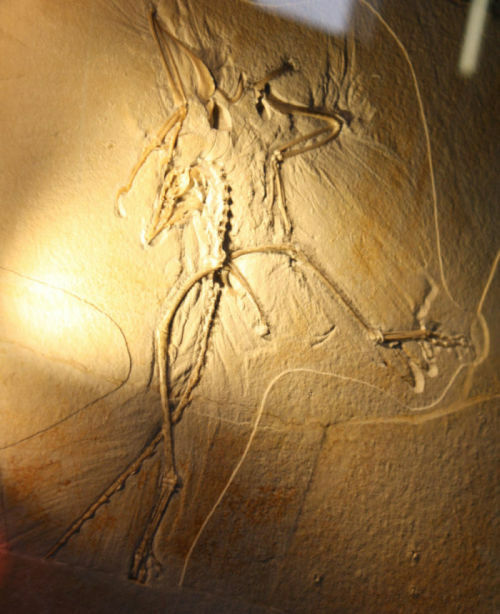 The sixth specimen of Archaeopteryx was recognized during the preparation of the fossil in 1987, it is the largest known and considered a full-grown animal. 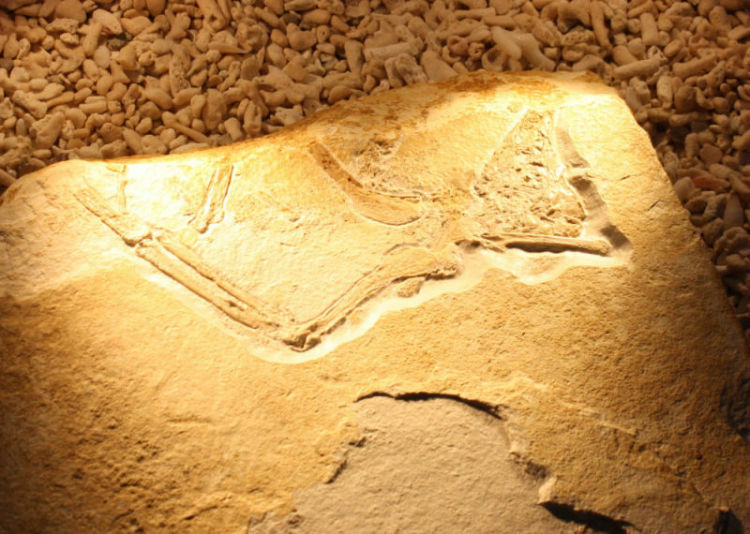 Exact location and time of the discovery of this fossil are unknown, during the seventies it was treasured in the collection of the major of Solnhofen - Friedrich Müller. 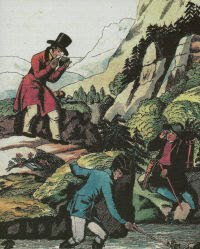 A worker of a quarry near Eichstätt claimed that it was discovered in 1985 and then sold to the major, if so an illegal action, but in 2003 the law case was closed; the provenance of the fossil - the investigated quarry - couldn't be confirmed. Today the specimen can be admired in the Major Müller-Museum in Solnhofen. Fig.3. The specimen of the museum of Solnhofen. The eighth specimen was not found in the limestone formation of the Solnhofer Plattenkalke, in contrast to all other fossils, but in the overlying and slightly younger Mörnsheimer Schichten in 1990. Only parts of the wings and skull are preserved. 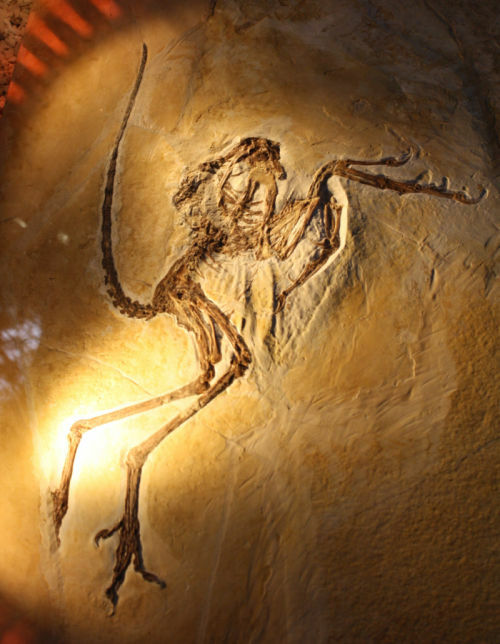 The exemplar is part of a private collection and still not studied, so the attribution to the genus Archaeopteryx is not confirmed. Fig.4. The specimen of the Mörnsheimer Schichten, treasured normally in a private collection. 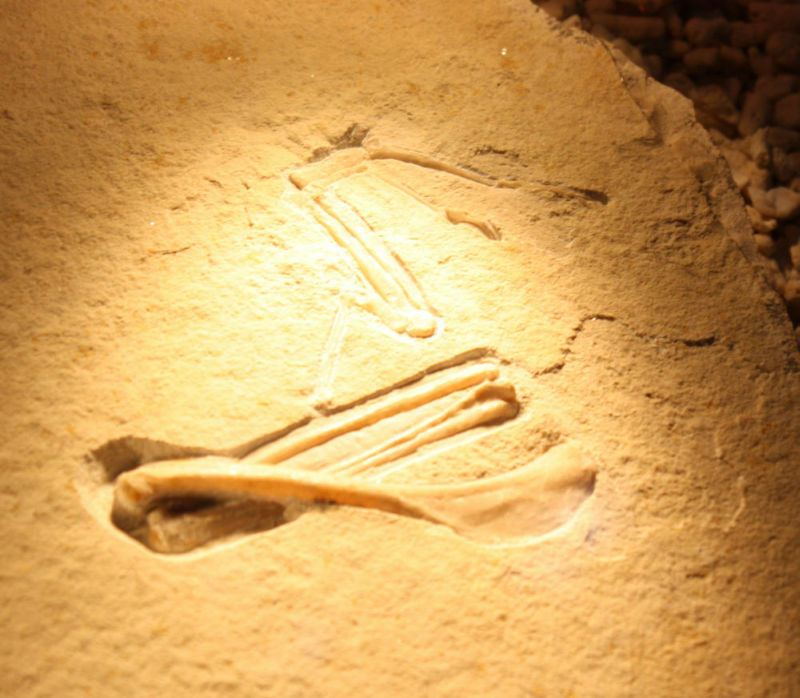 Another fragmentary skeleton is the ninth fossil of Archaeopteryx, the specimen of the family Ottmann and Steil, or "Chicken wing" (the right wing missing parts of the digits) for the press, discovered in 2004. The proportions of the bones are very similar to the other fossil bones of the known Archaeopteryx specimens; the attribution is confirmed also by the recognizable imprints of the feathers. The Thermopolis-specimen, after the actual location in the Wyoming Dinosaur Centre in Thermopolis, is one of the best preserved fossils of Archaeopteryx, the only displayed outside of Europe and the tenth in the order of recognized specimens. The circumstances of discovery are unknown, in 2001 the fossil was offered for sale, presumably by a private Swiss collector, first to the German museum of Senckenberg, but the costs were to expensive, so finally it was acquired by the Dinosaur Centre and presented in 2005 to the public. In this specimen the preservation of the second digit is notable, like in the Deinonychosauria it could be stretched backwards, an ulterior evidence for the relationships between mesozoic theropods and modern birds. 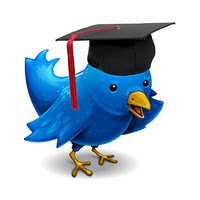 This is overall one of the best blogs (not just this post) I've ever read. Thanks for this! Are you by any chance a member of The Geological Society of America's History and Philosophy of Geology Division? Eichstätt is a city and not a village. It has a cathedral and Germany's only Catholic university. Having said that every village in the area has its own fossil museum. @ Kea Giles: thanks for the compliments - I´m located on the wrong side of the Mid Atlantic Ridge and sandwiched between the European and African Plate, so in the past I had more contact to the Old World Organisations, but I hope to chance this in near future. @ Thony C. thanks - 13.000 inhabitants would be a large village - I corrected the term, but the landscape is so green that I thougth it must be a rural area.